This beautiful 3-bedroomed mas has been converted to a very high standard in a contemporary style and offers uninterrupted views across the hills and river valleys of a stunning national park. The house enjoys sunlight from early morning until sunset. It sits at the highest point of a traditional hamlet, surrounded by vineyards, forests and streams, with a network of hiking and cycle trails direct from the doorstep. Just 9km from the elegant, but unpretentious primary duchy town of Uzes, with its sophisticated restaurants, art galleries and lively market, the house provides a haven of peace and stylish tranquillity. There are three bedrooms - one double bed, a second double (or two singles), and a third double sofa-bed - sleeping up to six. It has one bathroom and a second separate WC. There is a large open-plan kitchen and living area that is flooded with daylight through floor-to-ceiling windows, framing beautiful views across the hills and valleys. The house is fully equipped with modern kitchen appliances, media devices and wifi internet access. Double glass doors lead out onto a large south-west facing hill-top terrace with a medium sized L-shaped swimming pool. The terrace is planted with rosemary, thyme, oleander, camellia, and cypress pines and looks out to the south and west across the national park. It has sun loungers, a gas BBQ and a fire pit for chillier evenings. A large loggia shelters the outside dining area from the heat of the sun. Originally from London, we have lived in Geneva for over 20 years and have spent many summers with friends and family exploring the south of France; from the wilds of Carcassonne in the west, to the buzz and glamour of the Cote d'Azur. But it was Uzes, and its beautiful timeless villages that we were drawn to above all else, and then in late 2015, we found the utterly charming Mas Phenom. We fell in love with Mas Phenom at first sight. The house had been lovingly and tastefully restored by its previous owner to a very high standard. For us, the house and its wonderful garden that merges seamlessly into the surrounding national park, brings together perfectly the warmth of southern France, a deep connection with nature and the understated elegance of contemporary living. And with Uzes only 10 mins away, we could not imagine a better place to be. We can think of nowhere better to breathe in the aroma of wild thyme, watch the kites circling above the valleys, listen to the distant call of a wild boar and soak up the last rays of a Provencal sun by the pool, before watching a spectacular sunset in the peace and tranquility of a balmy evening. The house also has a second, separate toilet. Hotel quality Egyptian cotton sheets, pillow cases and duvet covers. Summer and winter duvets provided. Space for two cars, additional parking available in village. Fast free wifi connection for unlimited number of users. Set of two towels per guest, plus one large pool towel per guest. Large open-plan living area with floor-to-ceiling glass windows. Open-plan kitchen, equipped with Italian pro-style range oven with gas hob, fridge freezer, freshly-ground coffee machine, microwave, toaster, sink, dishwasher. Exterior dining area also available on terrace under covered loggia. Selection of cookery, local guide, fiction and general interest books. A selection of popular board games (in English) are available. Terrace is planted with oleander, camellia and other plants. A garden is on the north side of the house. All is unfenced. Tiled loggia covering south and east sides of the house, from which to shelter from the heat of the sun, or watch a passing thunderstorm. Large 20 metre terrace, with tiled loggia offering shade. Dining area, sofa area and sun loungers. L-shaped private pool (730x520m) with views across the valley. Not overlooked by any other houses. The house is situated at the top of the village giving wonderful views over Belvezet. 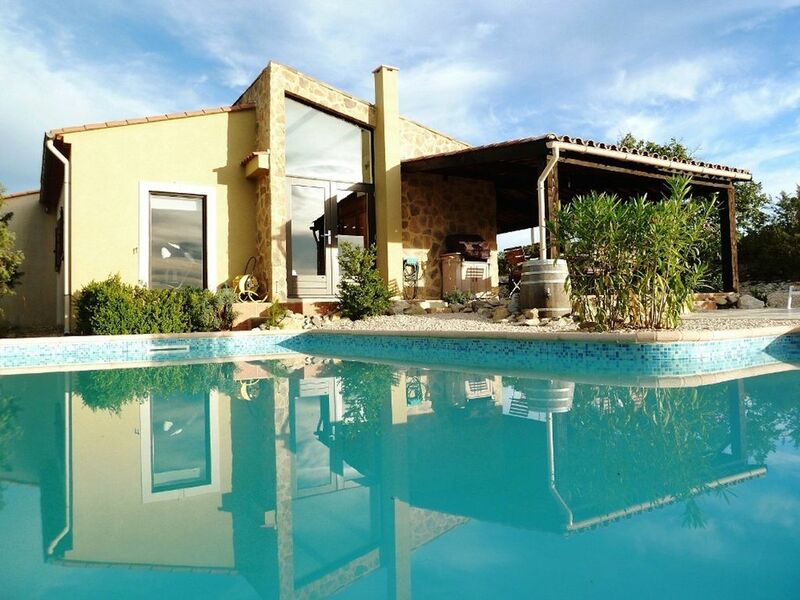 The house is furnished to a high standard and very well equipped, the temperature reached 38Deg whilst we there so made good use of the pool. Beautiful towns and villages to visit especially Uzes which has wonderful buildings and architecture and a fantastic vibe, our second visit to this area and we definitely be back soon. What an amazing experience. The property is in a beautiful location far from noise and with stunning scenery. The house itself is well laid out , tastefully decorated and with all modern amenities. We had a lovely time and enjoyed visiting all the near attractions. What an idyllic retreat. We only had three days at this beautiful stylish hideaway but could have easily stayed for weeks. Our days consisted almost entirely of lazing around the pool, eating beautiful local food and watching the sunset from the balcony, there didn't seem to be a need to do anything more. The house is fabulously equipped, the kitchen had everything we could have wished for and more. I can heartily recommend this little piece of heaven. What makes this place so stunning - the view!! Two of us went for a long weekend too this beautiful place. We found it very easy to get too with the directions given to us by Andy and Penny. We spent a lot of the time enjoying the terrace and swimming pool during the day and using the barbecue for dinner. We got a taxi to Uzes on Saturday night, for dinner. Which was friendly and reasonably priced. Over all we have a great time. The house is lovely and has every thing you would need. We would definitely like to go back again and would recommend it. Mas Phenom is a truly charming place surrounded by rolling hills, vineyards and historic villages. We enjoyed walking the local trails and exploring the wealth of Roman architecture nearby. The house has all you need for a retreat holiday with the added bonus of buzzy Uzes for restaurants, markets and shops. We recommend watching the sunset from the terrace - peaceful and stunning! The elegant market town of Uzes, with its galleries and shops, as well as its many restaurants offering dining from a casual brasserie to a Michelin star chef, is just 9km away. The surrounding area is full of medieval limestone villages, vineyards that open their doors for wine tasting and spectacular river valleys with opportunities for canoeing and swimming. The Romans left many a mark on the area, from the famous Pont du Gard, to the historic city of Nimes, both within 30 mins drive.